The retail mSATA SSD market doesn't have too many players. Most OEMs, such as Samsung (although that is about to change), Toshiba and SanDisk, only sell their mSATA SSDs straight to PC OEMs. Out of the big guys, only Intel and Crucial/Micron are in the retail game but fortunately there are a few smaller OEMs that sell retail mSATA SSDs as well. One of them is Mushkin and today we'll be looking at their Atlas lineup. Mushkin sent us two capacities: 240GB and 480GB. Typically 240GB has been the maximum capacity for mSATA SSDs due to the fact that there's room for only four NAND packages and with 64Gbit per NAND die the maximum capacity for each package comes in at 64GB (8x8GB), which yeilds a total NAND capacity of 256GB. Crucial and Samsung have mSATA SSDs of up to 512GB (Samsung offers up to 1TB now) thanks to their 128Gbit NAND but currently neither Samsung nor Micron is selling their 128Gbit NAND to other OEMs (at least not in the volumes required for an SSD). I'm hearing that Micron's 128Gbit NAND will be available to OEMs early next year and many are already planning products based on it. Since Mushkin is limited to 64Gbit NAND like other fab-less OEMs, they had to do something different to break the 256GB barrier. Since you can't get more than 64GB in a single NAND package, the only solution is to increase the amount of NAND packages in the SSD. 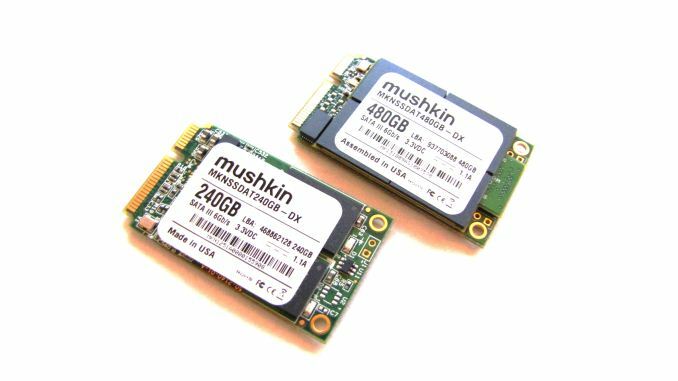 Mushkin's approach is to use a separate daughterboard with four NAND packages that's stacked on top of the standard mSATA SSD. There are already four NAND packages in a regular mSATA SSD, so with four more the maximum NAND capacity doubles to 512GB. However, the actual usable capacity in Atlas is 480GB thanks to SandForce's RAISE and added over-provisioning. The result is a slightly taller design than a regular mSATA SSD but the drive should still be compatible with all mSATA-equipped devices. Mushkin had to use specially packaged NAND in the 480GB model (LGA60 vs LBGA100 in the 240GB) to lower the height and guarantee compatibility. The NAND daughterboard seems to be glued to the main PCB and dislocating it would require a substantial amount of force. I tried to dislocate it gently with my hands but I couldn't, so I find it unlikely that the daughterboard would dislocate on its own while in use. The Atlas is available in pretty much all capacities you can think of, starting from 30GB and going all the way up to 480GB. Mushkin gives the Atlas a three-year warranty, which is the standard for mainstream drives. The retail packaging doesn't include anything else but the drive but you don't really need any peripherals with an mSATA drive. Here you can see the difference in NAND packages. The one on the left is the 480GB model and it's NAND packages cover slightly more area on the PCB but are also a hair thinner. Like many other OEMs, Mushkin buys their NAND in wafers and does packaging/validation on their own. Due to supplier agreements, Mushkin couldn't reveal the manufacturer but I'm guessing we're dealing with 20nm Micron NAND. So far I've only seen Micron and Toshiba selling NAND in wafers and as Mushkin has used Micron in the past (the 240GB sample is a bit older and uses Micron NAND), it would make sense. 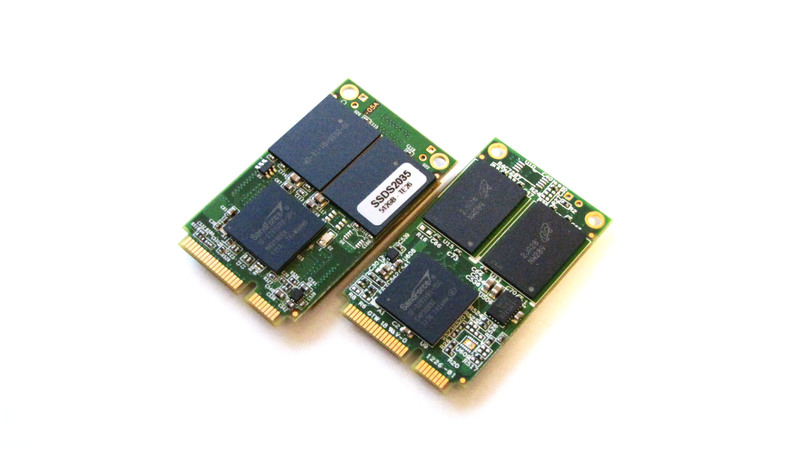 mSATA is only of interest when talking either about switching storage in your ultrabook or your thin mITX system. For everything else a standard SATA SSD is better in price/performance. And for those ultrabooks or thin-clients performance isn't the first question, but price and silent operation.